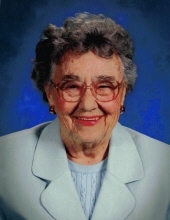 Mary Lou Luck, 91, of Farmer City, Illinois, passed away at 7:25 A.M., Tuesday, February 13, 2018, at Carle Foundation Hospital, Urbana, Illinois. Cremation rites have been accorded. Services will be at a later date. Memorials may be made to a charity of the donor’s choice. Calvert-Belangee-Bruce Funeral Home, Farmer City in charge of arrangements. Mary Lou was born October 8, 1926, in Sullivan, Indiana, a daughter of Raymond Rexford and Blanche Weaver Rowland. She married Carl L. Luck on July 13, 1952, in Robinson, Illinois. He passed away August 24, 2006. She is survived by her children, Kurt (Mary) Luck of Durham, North Carolina, Gay Ann Luck of Kansas City, Missouri and Van Luck of Farmer City, Illinois; three grandchildren. She was preceded in death by her parents and son. May Lou was a Grade School teacher in the Blue Ridge School District for many years. "Email Address" would like to share the life celebration of Mary Lou Luck. Click on the "link" to go to share a favorite memory or leave a condolence message for the family.